Refugee-related press releases, open letters, and status updates from Mission Free Iran, World Without Borders, and ICRIR will be archived on this page as they are published. September 28, 2011: RENEWED CALL: URGENT: Letter-Writing Action: Stop Sweden’s Illegal Deportation of Ahwazi Activist Ali Mansouri! September 14, 2011: URGENT: Letter-Writing Action: Stop Sweden’s Illegal Deportation of Kurdish Opposition Activist Fouad Velzi! September 6, 2011: دولت سوئد تصمیم دارد فواد ولزی را به قاتلین فرزاد کمانگر تحویل دهد! August 31, 2011: URGENT: Time to Phone and Fax to Demand a Halt to Mitra Kahrom’s Deportation to Iran. August 29, 2011: Mitra Kahrom: Because She is a Woman. | URGENT: Stop the Illegal Deportation of Mitra Kahrom to the Misogynist Islamic Republic of Iran. August 28, 2011: Deportation of Ali Mansouri Halted! August 23, 2011: URGENT: Letter-Writing Action: Stop Sweden’s Illegal Deportation of Ahwazi Activist Ali Mansouri! August 22, 2011: Mr. Billström! Mitra Stays… and the Islamic Regime Goes! August 19, 2011: Navid Stayed in Sweden, and So Shall Mitra! August 16, 2011: Mission Free Iran’s Open Letter to the Swedish Migration Board: Navid Can NOT Be Deported! August 16, 2011: PROTEST TODAY in Support of Navid Mirpourzadeh: Solna, 14:00 – NO DEPORTATION TO IRAN! August 12, 2011: Swedish Government’s Attempt to Deport Peyman Najafi Halted; All Hands on Deck for Navid Mirpourzadih! August 10, 2011: French Union CGT ADDSEA Stands Up for Iranian Refugees: Suède : Halte aux expulsions d’opposants iraniens ! August 6, 2011: Letter-Writing Action: Stop Sweden’s Illegal Deportation of Navid Mirpouzadih, Mission Free Iran’s Coordinator of Asylum-Seeker Activities in Sweden! August 6, 2011: URGENT: Letter-Writing Action: Stop Sweden’s Illegal Deportation of Peyman Najafi! August 4, 2011: فوری! با اداره مهاجرت و سفارت خانه‌های سوئد تماس بگیرید، به خواهید که از دیپورت پیمان نجفی به ایران، و زندان، شکنجه و اعدام خود داری کنند. August 3, 2011: URGENT: Contact Swedish Migration Office and Swedish Embassies & Consulates to Stop Deportation of Peyman Najafi to Torture or Execution in Iran! June 8, 2011: Låt Marzyeh Kamangar Stanna! May 25, 2011: ICRIR: URGENT ACTION REQUIRED: Stop Illegal Deportation of Hussein Gafeel Hwaees from Iraq to Iran! 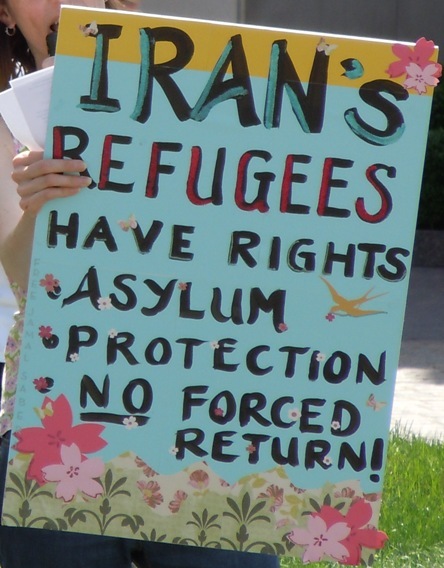 May 4, 2011: ICRIR: Illegal Detentions of Iranian Refugees in Cyprus: Break the Silence! April 20, 2011: ICRIR Letter-Writing Action in Support of Iranian Refugees in Cyprus: Stop Harassment of Disabled Senior Citizen Ameneh Samry! March 6, 2011: ICRIR Press Release: IRAQ: Iranian Refugee and Social Activist Ardeshir Fatehi to stand trial for participating in an anti-Islamic Republic protest! February 14, 2011: No! to Secret Deportations of Iranian Refugees from Kurdistan, Iraq! December 23, 2010: Letter-Writing Campaign: We Condemn the Greek Government’s Savage Attack on Refugees. December 17, 2010: Four Years of Impenetrable Silence: Is This UNHCR Policy for Iranian Refugees? The Case of Mohammad Ghamari Tabasi. December 15, 2010: ملاقات ای سی‌ آر‌ای آر با نمایندگان یو ان اچ سی‌ آر، نگرانی‌ در مورد تظاهرات پناهجویان در ترکیه باقیست. December 6, 2010 (a): ائتلاف برای حمایت از پناهجویان از کمیساریای عالی‌ پناهندگی سازمان ملل میخواهد نقض حقوق پناهجویان ایرانی و سایر پناهجویان در ترکیه را متوقف کند.